This article gives you complete information about Diego Forlan, best football player in current Uruguay team. More details about the biography and profile of Diego Forlan is quoted in this article. Read this article till the end for complete details. The full name of Diego Forlan is Diego Forlan Corazo who was born in the year 1979 May 19 at Montevideo, Uruguay. Diego Forlan is cone of the best player in uruguay football team. He is a striker in the team. Diego Forlan has played a brilliant performance in 2010 football world cup where he scored 5 goals in the tournament and became one of the top scorers in 2010 world cup. 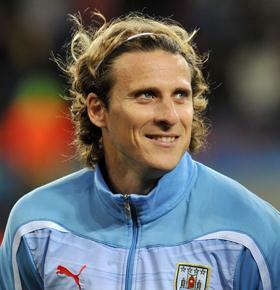 Forlan played a key role in bringing Uruguay to the semifinal of 2010 world cup. Forlan was awarded golden ball in 2010 FIFA world cup for best player in the tournament. His success journey continued in 2011 also where Forlan played an important role in 2011 Copa America where Uruguay were the champions. Forlan had scored 31 goals for Uruguay in his career. The current club of Forlan is Internazionale. More details about the profile and achievements of Forlan are given below.